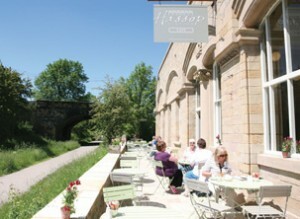 Situated in the heart of the peak district, joining the Monsal Trail one of the most spectacular leisure routes in Britain, the Hassop Station cafe was opened in 2010. The elegant old station building, complimented with a large sunny days, is perfect for sunny days and outside dining. The fully licensed cafe serves a large range of delicious homemade food, made with locally sourced products. Breakfast is served every morning from 9am, offering a range from croissants to fruit salads. The cafe is open 7 days a week from 9am – 5pm. Hassop Station is extremely child friendly and has disabled access, cloakroom and free wi-fi.